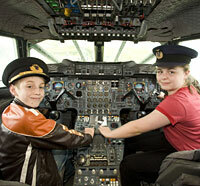 Manchester schoolchildren got some high-flying lessons when they attended a special aviation school at Manchester Airport. MMU's Centre for Air Transport and the Environment and Faculty of Science and Engineering joined forces with Aim Higher, Excellence in Cities Programme, to deliver a three-day Sustainable Aviation Summer School. The initiative also involved Manchester Airport, the Museum of Science and Industry in Manchester (MSIM) and Manchester University. Twenty students aged between 10-11 years from Manchester Schools spent three days learning about flight, the aviation industry, the role of Manchester Airport in supporting the development of the City Region, the social and economic benefits that result along with the associated adverse environmental and social impacts. Students were given a series of master classes from Professor Callum Thomas, Chair of Sustainable Aviation, and visited Manchester Airport to look at Concorde, the operation of the airport and the ecological and habitat protection work around the second runway. At the summer school they learnt about the principles of flight, visited the historic aircraft collection, saw a wind tunnel and got the chance to fly radio-controlled helicopters. At the end of the course each student received a certificate for attending what is believed to be the first sustainable aviation course of its kind. Professor Callum Thomas, of MMU's Centre for Air Transport and the Environment, said: "The aviation industry is playing an increasingly important role in our global economy and multicultural society. The social and economic benefits of air transport are significant and growing, but the environmental costs, especially the disturbance caused by aircraft noise and the implications of aviation for climate change are significant also. "Sustainable aviation is about getting the right balance between those costs and benefits. It a world that is becoming increasingly constrained by environmental issues it is important that young people are aware of the consequences of their choices whether this be in relation to taking the bus or the car or the environmental consequences when they go on holiday." Previous Story HR is the new IT!